A typical toaster costs $15, and does a fine job of crisping your crusts. But for just $285 more dollars, you can watch your bread burn from behind a double-paned glass window. Unnecessary? Definitely. But boy is it fun watching the bread brown. Here's the toaster of the future-and three other expensive, over-the-top, but still awesome kitchen gadgets. 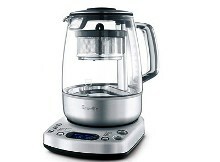 Sure, you can make tea by heating water on a stove top-or you can pay $250 for a single-purpose tea maker. That being said, this product is kind of amazing, and probably the most futuristic way around to drink a decidedly ancient beverage. Fill the tea basket with loose leaves, press a button, and the basket automatically lowers into the hot water like an elevator before pulling back up when the seeping is complete. I've tested it, and believe me when I say that this thing is a conversation starter. As with many coffeemakers, you can program this tea maker to have perfect tea ready and waiting when you wake up in the morning. When images of a transparent toaster hit the Web a few years ago, they went viral, proving that there was a definite desire amongst consumers to see their bread brown before their eyes. 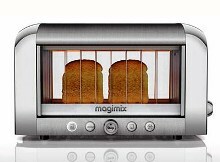 Sadly, the pellucid product in question was just a concept, one that inspired Magimix to create its own see-through toaster — a $300 countertop showpiece that toasts the bread behind a double pane of glass. At PM, we're suckers for all things space. 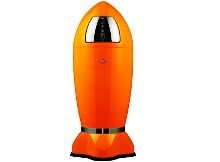 So when we saw this rocket-like trash can (which will give a whole new meaning to "space junk" when it comes to the U.S. later this year), we were almost able to justify the space-high price. Almost. 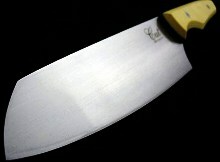 To some people, a kitchen knife is little more than a way to slice and dice. To others, it's a work of art, and a culinary samurai's most valuable tool. Cut Brooklyn knives are handmade by a single Brooklyn-based craftsman, and have earned a reputation for delivering some of the best-quality cutters on the market — a fact that has also earned them price tags that range in the ballpark of several hundred dollars. Still, even at these prices, would-be owners will have to wait-demand has so far exceeded the supply a single craftsman is capable of delivering, that he's suspending new orders until at least the summer. Actually, knives could justify a high price tag. I paid a lot for a Cutco knife but I love it and would actually gradually replace all my knives with Cutco if I could afford it. I never have to sharpen the knife and it goes through everything. I have a Cutco potato peeler and scissors and they are incredibly durable. If I have to pay more for something I'll probably never replace, I think that's cost effective.